The last time I visited my friends, the Yous, they had recently adopted their first (I think) greyhound. I can't remember his name but I remember his battle-worn, brindled face because they had recently discovered that he had severe separation anxiety. His solution to that anxiety was to try and escape the house...by putting his face through the windows of their French doors, so he was sporting some grizzly stitches. But, like most greyhounds, he wasn't vain, just in need of constant companionship and he got plenty of love and was kept well away from French doors. As the years have gone by the Yous have had a human child and continued to rescue ex-racing greyhounds. Despite not having visited them in person I am able to keep up with this information through the magic of Facebook. In the midst of the saga of receiving Eddie here in Brooklyn Facebook told me that over in New Jersey the Yous had to let go of one member of their current pack, Bubba. Bubba (pictured) was 11 years old. From what I understand he'd broken a leg back in his racing days and there were complications with way it was set. Being a dog and therefore being pretty much impervious to pain he soldiered on but last week he lost all feeling in the back end. For any dog, but especially for one known for speed and agility, being immobile is no life at all so off he went. My instinct was immediately to side with the mourning. I still miss my girl. It was confusing. But you can't ignore 13.2 lbs of terrier-adjacent mutt if you want to escape with your sanity, which is no excuse but that's why it's taken me a few days to catch up to formally wishing Bubba a safe journey. I shouldn't need to say it but, as is the custom here, remember to lavish more treats and affection on your beings. "Good standing." "Good breathing." "Good....lying there like a lump." Today we reward it all. It's my tendency, when a dog passes away, to wish him or her "godspeed." When it's a greyhound I think no other farewell is appropriate. Godspeed, Bubba, I hope the track is dry and the rabbits are plentiful. you do this better than anyone I know. and it's always so beautiful and right. Thank you, Kizzy. He was a good dog and will be much missed. He was our Velcro dog - always underfoot - so the house feels especially empty without him. We're hoping Mabel is OK as an only dog for a while, as it isn't feasible right now to enlarge the pack, but we will be welcoming another greyhound or 2 or 3 into our lives down the road a piece. I'm sure he's running free and happy and eating all the junk he wanted in life, but his sensitive stomach forced us to withhold! We love you Bubba, you big galoot! Bring Eddie out to NJ to play - we'll make sure Mabel stays muzzled until she is sure little Eddie isn't a rabbit! Treats for everyone! 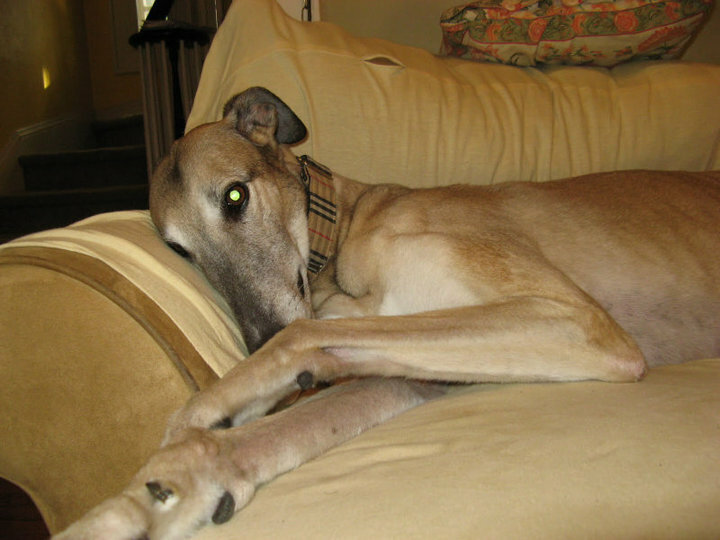 (Actually maybe a few more than usual... we have a special place in our hearts for greyhounds.) Marian, I'm thinking of you and your human & dog pack... this hits a little too close to home. Our friends Tiffany and Tom are also greyhound rescuers/adopters. The first one was Dogee (d o g). He was so sweet and calming. They all seem so very Zen. Each one has been a heart breaking loss not just to Tiffany and Tom, but to all of us who knew them. The people who open their homes and hearts to these kinds of dogs are unspeakably brave and giving. What a GOOD boy. So beautiful. Aw. 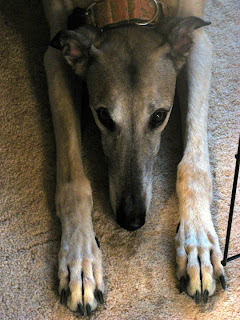 My ex-FIL had 2 rescued greyhounds and they had the sweetest dispositions. I have no idea what happened to them, unfortunately. He split up with his girlfriend of many years and she kept the dogs. I miss him and the dogs.